1. What is the difference between the active and the contemplative life? 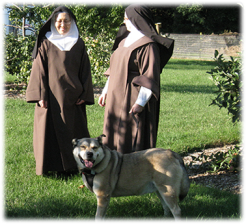 Religious Orders that live the active life serve the Church through an active apostolate and are typically referred to as sisters. This can be in the form of teaching or preaching, ministering to the sick or to the poor, or any other form of work that serves the needs of God’s people. Religious Orders that live the contemplative life serve the Church through lives of prayer and are typically referred to as nuns. They live in monasteries and do not leave the monastery to serve actively. They pray for souls, for the Church, and for the needs of the world. This is their "work." Women in both forms of religious life - the active and the contemplative - are consecrated to God and are committed to the spiritual life and lives of prayer. Dedication of their lives to God is the singular purpose which motivates their work and their every deed. 12:45 PM - Dinner and cleanup (followed by free time). The sisters organize the afternoon between Mid-Afternoon Prayer, Spiritual Reading and work time. 9:00 PM - Period of solitude beginning of the Great Silence (in speech and action), which continues until the end of Morning Prayer the next day. Into our weekly schedule we have incorporated one unstructured day (hermit day) of solitude where the only community act we assemble for is the Eucharistic Liturgy. 3. Do you ever leave the monastery? Yes, we leave the monastery for doctor and dental appointments and to attend to business or errands that others cannot take care of for us. 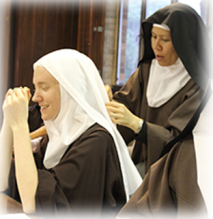 In addition, we strive to be a pro-active community with regard to community and spiritual growth and so we attend Carmelite Association meetings - collaborative meetings with other Carmels – Ongoing Formation meetings, and occasional Vocation events. 4. Do you ever talk? We do indeed talk, primarily during recreation, which is twice each day, and on recreation days. Throughout the day we strive to keep conversation to a minimum, talking when necessary to accomplish our tasks. Silence is an important element for creating an atmosphere of recollection and prayer- silence in speech as well as in our actions. Our meals are in silence while we listen to a reading from a spiritual book. 5. What kind of work do you do? Perform as much of the work as we are able to in order to keep up our monastery, guest houses, and monastery grounds. 6. Do you ever see your family? Families are most welcome to visit. We have two guest houses to accommodate them. We do not typically go home to visit family unless a parent is in poor health, in which case we send the sister home to visit and help out when there is a need. 7. What is the age-range for someone who wants to enter? The age-range for joining our community is 21 - 45. 8. How do I know if God is calling me to religious life? 9. What is required in order to join your community? 10. What is the process for joining? Spend time of mutual "getting to know you" with our vocation director through correspondence or phone. If it seems as though you may have a vocation to Carmel and you wish to visit, you would then: arrange to visit the community, staying in our guest house. After some time is spent in our getting to know one another and you wish to take the next step, you would: visit the monastery for a live-in experience, usually this is for 1-3 months. If you then feel that you have a call to Carmel and wish to join our community, you would apply for acceptance. 11. How long is formation? 12. Is there someone who will help me with prayer and spiritual growth if I am accepted into your community? Our Formation Director will guide and direct you throughout your time in formation. She will be assisted by a formation team to present classes to you during your years of formation in Carmel.